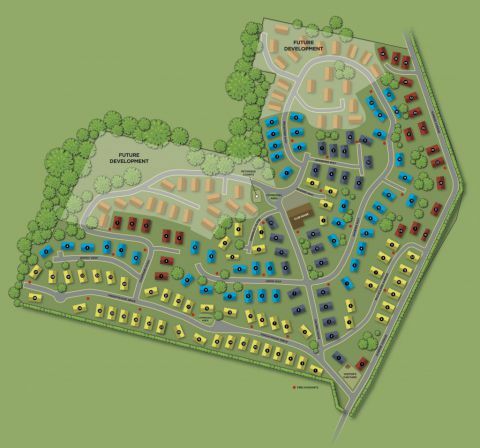 Killarney Park is a welcoming, well-established gated community locates in the idyllic Nottinghamshire countryside. Designed exclusively for the over 45s, there are 148 beautiful homes situated in over 35 acres of picturesque woodland, offering a wide range of amenities. Killarney Park is a hidden gem, located just six miles from the city of Nottingham. The Park can offer you the serenity of the countryside with all the conveniences of modern day life nearby. The local area is steeped in history; close by is the historic Bestwood Lodge which was once the royal hunting estate of King Charles II and Nell Gwynn. Newstead Abbey, the former home of Lord Byron is a short drive away and at the heart of Robin Hood country is Sherwood Forest offering medieval tales and fantastic walking trails. The Lakeside Restaurant & Spa is at the end of Lamins Lane and with several golf courses, country walks, pubs and restaurants within a three mile radius, you’ll never be short of something to do! If you want to stay closer to home then take advantage of the on-site clubhouse with a bar and lounge. Here’s where residents are able to relax and chat with friends and neighbours. The residents themselves arrange activities throughout the year such as bingo, arts and crafts classes, exercise clubs, Petanque, darts and bird watching as well as organising supper evenings, lunch clubs, coffee mornings and themed party nights. The park also runs a courtesy bus service with regular trips to the local market town of Arnold along with weekly visits to Nottingham and Mansfield. Whether you are looking for something already available or wish to design your own bespoke home, Killarney Park gives you the opportunity to have your dream park home. For more information, call us on 0845 340 2861 and speak to a member of our sales team or fill in the form below and we'll get back to you. I’ve only got to step out the door and I’m in the countryside. The people are very nice on the park, I’ve got good neighbours – it’s got everything going for it!